The Dell Optical Mouse - MS116 features optical LED tracking and wired connectivity providing a stellar performance day after day. Improve your productivity at the office or at home the Dell Optical Mouse will help keep you on task with accurate 1000 DPI optical tracking. The Dell Optical Mouse MS116 features optical LED tracking and wired connectivity providing a stellar performance day after day. Improve your productivity at the office or at home the Dell Optical Mouse will help keep you on task with accurate 1000 DPI optical tracking. Designed for comfortable use over extended periods of time, the Dell Optical Mouse is your desktop partner. Shaped and sized to fit the contours of your hand with 2 buttons and a scroll wheel, the Dell Optical Mouse makes it easy to navigate through on screen projects. Dell Wireless Optical mouse with mini USB sender. Take your work on-the-go with the reliable wireless connection of the Dell Wireless Mouse-WM126. You can also connect up to six compatible devices with a single receiver, allowing you to wirelessly connect with your keyboards and mice at home, in the office or on the move. Work in comfort thanks to a contoured design that feels great in either hand. The mouse features three clickable buttons (left, right, and middle) and includes a scroll wheel for ease of use. Your mouse comes ready to plug and play via the included receiver. No software or drivers are required. please go to Dell.com/pair to download the required software. Enhance daily performance and productivity with the Dell Premier Wireless Mouse - WM527, which features an elegant design that will fit into virtually any workspace. Improve your day-to-day performance with the Dell Premier Wireless Mouse - WM527. Easily navigate on almost any surface,including glass and high-gloss surfaces with the 1600 dpi laser mouse. With flexible wireless connectivity you can easily switch between three devices desktop, laptop and mobile devices using 2.4GHz wireless or Bluetooth LE. The nano dongle connects the mouse and up to six total compatible devices using 2.4GHz wireless Dell Universal Pairing (Dell.com/Pair). This provides you with one dongle for your compatible devices, whether at your desk or on-the-go. For increased productivity you can simultaneously pair up to two compatible devices with Bluetooth LE. The ergonomically designed mouse allows you to work in comfort throughout your workday. Featuring a smooth arc shape, the mouse brings convenient shortcuts to your fingertips with five buttons. Constructed of premium materials, the mouse features an elegant design that will fit into virtually any workspace. With 6 months of battery life, you don't need to worry about running out of power during your busy day. Designed with sleek lines, a compact size and chiclet keys, the Dell Wireless Keyboard and Mouse KM636 offers a contemporary and comfortable design with the convenience of wireless performance. The compact size of the keyboard also takes up less space on your desktop and is designed for comfort during prolonged usage. The KM636 has a muted typing sound and reduced key gaps to help prevent dust accumulation, plus a mouse scroll wheel that has been enlarged to enhance productivity. Set up is easy, so you can quickly enjoy the freedom and flexibility of typing and using your mouse and keyboard wirelessly. With elevated and spacious chiclet keys, multimedia keys, plus optical tracking for precise mouse movement, you can rely on the Dell Wireless Keyboard and Mouse KM636 for a comfortable and productive user experience. The wireless keyboard and mouse are your everyday, get things done, productivity partners at your fingertips. 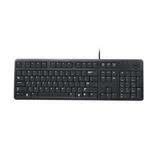 The Dell wireless keyboard and mouse KM636 also has a palm rest that is available for separate purchase. With the choice of wireless connectivity, you can easily switch between three devices desktop, laptop and mobile devices using 2.4GHz wireless or Bluetooth LE. With 12 months of keyboard battery life and 6 months of mouse battery life, you dont need to worry about running out of power during your busy day. Easily shift from usage to portability by twisting the Dell Bluetooth® Mouse from the open shape that comfortably fits your hand when you're working, to the folded slim mode that you can slide into your pocket. Twist the Dell Bluetooth® Mouse into slim mode and take it with you to the office, your favourite coffee shop, home or on the road. Untwist the mouse and you'll be equipped to increase your work productivity wherever your on-the-go lifestyle takes you. The Dell Bluetooth Mouse-WM615 is compatible with Windows® 8/8.1/10 using Bluetooth 4.0 radio. For Windows® 7 PCs using Bluetooth 4.0 radio, it has been tested with select Dell PCs and wireless chipsets*. Please update your PC's Bluetooth drivers to the latest version before connecting the mouse. Please note that systems using earlier versions of Bluetooth are not compatible.